Looking back on it, I had my first attack when I was 15. I was coming up to my GCSEs and I used to play the violin quite well. Around that time my fingertips went numb, and my playing standard and writing speed both suffered. They put it down to a virus and nothing more was said. When I was 24 I noticed a kind of numbness in my face and I was feeling really, really tired. I realise now that could have been MS fatigue, you know: when even blinking feels like too much of an effort. Then in 1994 I was visiting my boyfriend in Newcastle and I woke up and I was feeling numb, and I knew I wasn’t safe to drive home. And I went to the doctor there, and he was the first to mention having tests to rule out MS. From then on I knew it was a possibility. I had an MRI scan about a month later and it was confirmed. I suppose I did try to forget about it, but it just plays on your mind. On the one hand you feel incredibly guilty because you think – I’m so lucky, I look fine, my symptoms are pretty mild. On the other hand you’re 24, 25, you feel your whole life crashing down. For a while you think I’m going to wake up and not be able to move. So it takes time. It’s hard to be told go away and forget about it. Because you can’t. In some ways it wasn’t all a bad thing, though, because it made me reassess what was important to me. I’d been a very high achiever, working really hard, for really long hours, going to the gym before work. It made me reassess what was important to me. It did change my outlook from thinking my career would be the be-all and end-all for 10 years. It gave me a different perspective. I was halfway through an NHS management scheme when I was diagnosed. I was very interested in working in healthcare before I was diagnosed, but then it became even more important. Having that dual perspective of manager and a patient was quite useful to me, especially when I came to manage neurology services when the Risk-sharing Scheme came along, with the introduction of the first MS drugs, and this whole influx of cash into MS services. I was involved in appointing the MS nurses here in Leicester and I thought to myself I might need to use you one day. And of course I do. The MS nurses here are great. There was nothing like that before. I know that if I was diagnosed today I would get really good care, right from the start. I didn’t have to tell anyone apart from those closest to me and occupational health until 2004. Before my daughters were born I had another mild attack, but up until then I was OK. I noticed my foot was getting weaker, but I didn’t have that many concerns apart from the fatigue. Work were fantastic when I told them. I had to reduce my hours and that meant a financial hit. But work helped me do that. I know from experience that not everywhere is so understanding. I was a very professionally driven person, so it was really hard deciding to stop working. I felt it was so much a part of how I saw myself. But I’d got to the point where even three days a week felt too much. I was unable to take my children to school or do anything else outside of work. So it felt like it was time to rebalance. So we thought there was an opportunity for me to get more involved with the Green Party politics and do some good for people with disabilities in other ways. So I’m very busy now but I feel like I have more control over my work/life balance. I’d always been fairly leftwing in that my family had always supported the Labour Party. But when we had our kids I started thinking much more seriously about environmental and social justice issues and what we were leaving for them. And that’s when I got involved in green politics and in 2007 I joined the Green Party. When I joined it was quite small, but we had a surge in support last year. Being active in politics can sometimes feel even busier than having a conventional job. But I try and limit myself to one evening meeting a week. It was really tough in the run-up to the election, because I was standing for council. I was absolutely shattered for about a month. It was a reminder that I can’t do a lot of late evenings. It’s really annoying, but it’s a reality. I’m mobile, but I do find walking long distances an issue as I have foot drop and wear an FES device. Obviously a lot of politics happens in London. When you go down there you might find that a tube station says that it is wheelchair accessible, and it is. But they don’t tell you that it’s a 15 minute walk from the station entrance to the platform. Which is a big issue for me. Disability isn’t all about being in a wheelchair. I’m really pleased to also have a national role as disability spokesperson for the Green Party. I’ve got to meet some really interesting people. It gives you more of an overview of the challenges disabled people face. Not just people with MS, but across the spectrum. I feel passionately about disability rights, but also the green issues. For me it was a dream position really. The Green Party subscribes to the social model of disability. If someone uses a wheelchair, for example, and they can’t access the local shop, it’s not that person’s fault, it’s society disabling that person. Vast swathes of the population have some kind of disablity. If the way society is structured means that they can’t take a full part, they’re missing out, but also society is missing out. Because there are so many incredibly valuable people with so much to give who happen to have a disability. At the moment I’m really concerned with the hidden cuts affecting people with disabilities. Everyone talks about ATOS and PIP. But for me, trying to maintain the support packages disabled people have is equally important. I notice that the Red Cross Centre round the corner from my home has shut. They’ve got rid of the disability equipment aid budget. The hidden story for this is that for some people these were lifelines, and they’re gone. The NHS is facing huge challenges of course. It’s scary from where I’m sitting. One of my real horrors is the homecare delivery market. Lots of people with MS have their drugs delivered to their home addresses. I know I experienced huge problems with private delivery services. I ran out of medication several times and spent several days, waiting and on the phone, in tears, trying to get my medication. And when I looked it up online it was happening to thousands of people. I was wondering - why aren’t they taking the contract away from them? And then I realised it was because there was no one to take the contract back. The way it’s been set up, private companies can claim VAT back on drugs that are delivered to someone’s home, while the NHS would have to pay 20 per cent VAT. The market has been set up in a dysfunctional way. As an ex-NHS manager I thought, if I have an attack because I didn’t take my medication, the people who are going to pick up the pieces are the NHS. I’ll probably be admitted to a neurology ward. I’m sure there are good examples of private companies working in the NHS, but there are some terrible examples too. I hope to stand as an MP in the next general election. 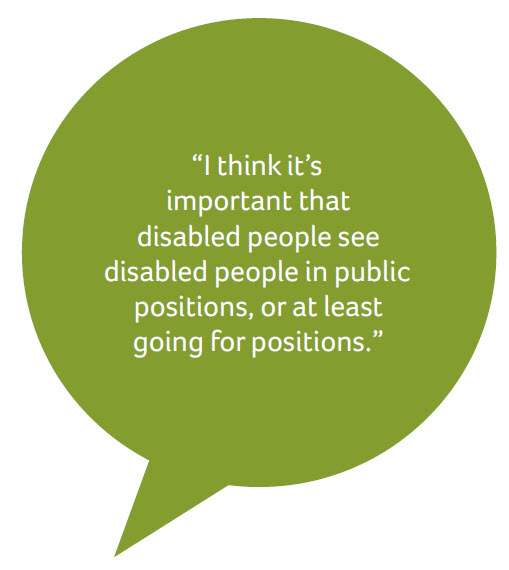 I think it’s important that disabled people see disabled people in public positions, or at least going for positions. Sometimes people tell me they appreciate my work, even the local campaigns. Some day when I’m tired I might walk with a stick, and people say I’m so pleased that you’re doing this. Sometimes you see other people with disabilities and you share that moment when you look at each other and share a common understanding. I’d recommend that young people with MS who want to be politically active just go for it. It’s really important that our voices are heard. There are so many ways they can get involved online - it doesn’t necessarily mean that they have to go to meetings or go round knocking on doors on election day. Politics can get very frustrating, but every now and then you think - I made a difference! You can really feel energised. We're delighted that Mags is sharing her experience and insight as part of our MS Forward View project.